I don’t know about you, but I go through candles like WOAH. (Turns out burning a scented Mason jar candle for hours on end, every day, goes through it quick!) There’s just something about scented candles that is so lovely: it makes your home feel warm and inviting–not to mention smell amazing. If you’re like me, you can’t (or don’t want to) spend $25 per candle at some expensive candle stores, like Yankee Candle. You also might be concerned–like I am–about what exactly is in those candles that you buy at the store. The biggest issues with traditional, store-bought candles are the toxic wax and wicks used to make them. Paraffin wax (a petroleum by-product) can release harmful chemicals–like benzene and toluene–into the air. These toxic chemicals may damage the lungs and contribute to the development of health risks like allergies, asthma, and even cancer. In addition to the wax, the wick can be toxic as well: candle makers used to use lead (!) in the wicks to make them stand up. Although it’s unlikely you have candles with lead wicks in your home (they were banned in 2003), it never hurts to make sure you don’t purchase new ones: make sure that any candle you buy has “lead-free” on the label. 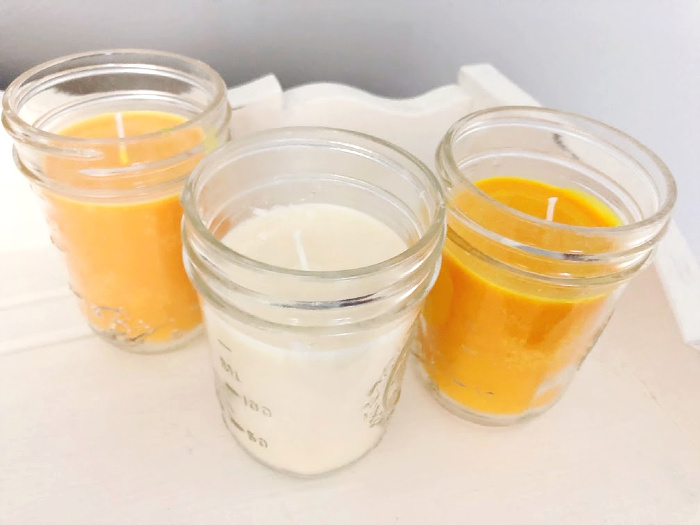 Today, many candles are soy-based or beeswax-based, but unfortunately there is a problem with some of those as well: synthetic fragrance. It turns out that, when burned, synthetic fragrance can also release harmful chemicals into the air. At this point, you might be on the verge of swearing off scented candles for the rest of your life. But there’s good news! You can make your own scented candles at home using a Mason jar! 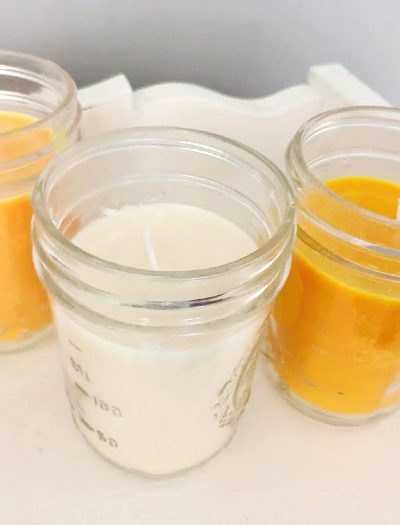 Making your own candles is fast, easy, inexpensive, and healthier for you. 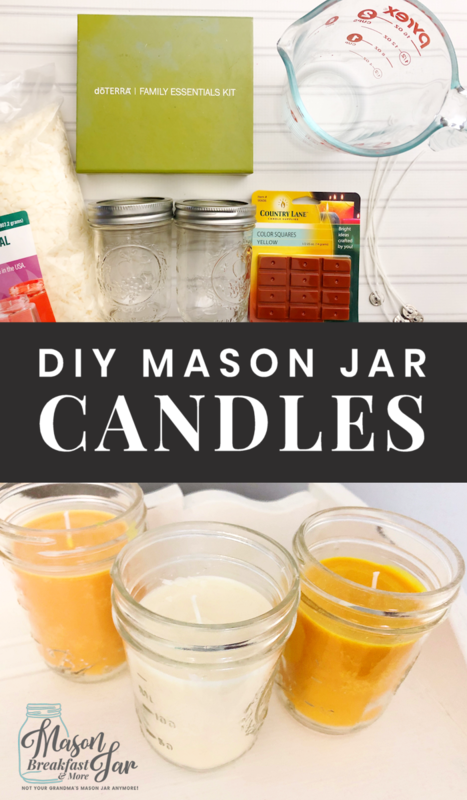 I love making soy-based scented Mason jar candles for my own home and as gifts for family and friends. The best part about DIY Mason jar candles is that you get to choose the type and amount of fragrance. Do you want just a faint trace of vanilla wafting through your home? Or do you want guests to notice the unmistakable scent of lavender? You can make any scented Mason jar candle, just by varying the type and amount of essential oil you use. 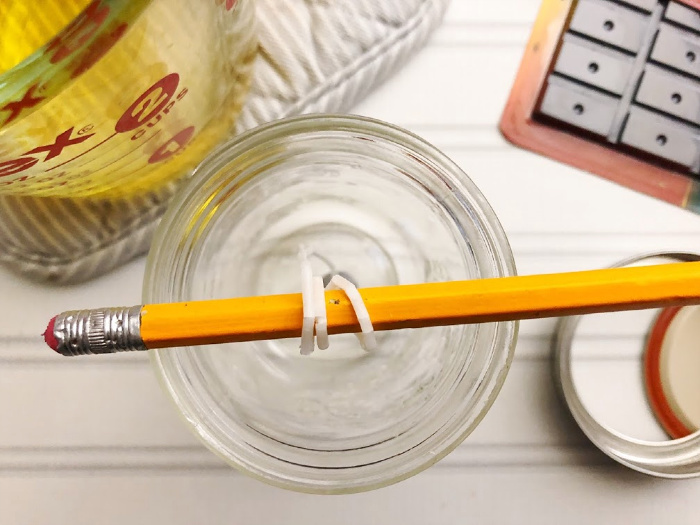 Ready to make your own soy Mason jar candle? Let’s get started with my favorite DIY recipe. 1. 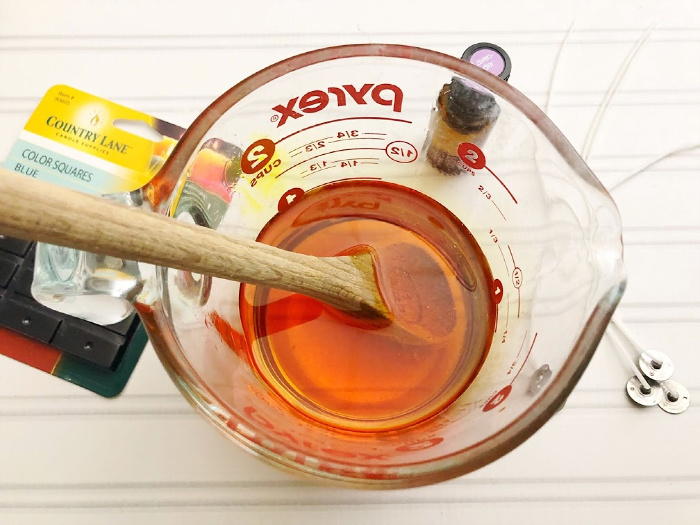 Fill your Mason jar twice with wax flakes and add them to a glass measuring cup with a wax color square. (you will need twice as much wax flakes as the jar you’re using). 2. Heat in the microwave for 2-3 minutes, stirring every 30 seconds. Remove with a heating pad and with caution, as the wax will be very hot. 5. Carefully pour your melted wax into the Mason jar, filling it about 3/4 of the way up. Let cool at room temperature overnight. 6. Trim your wick and display! *Always supervise a candle while it’s burning. For more DIY soy candle recipes, be sure to have a look at the Evergreen & Herb Mason Jar Candle and the DIY Funfetti Soy Mason Jar Candle. Both of these scented Mason jar candles make great party centerpieces or gifts! 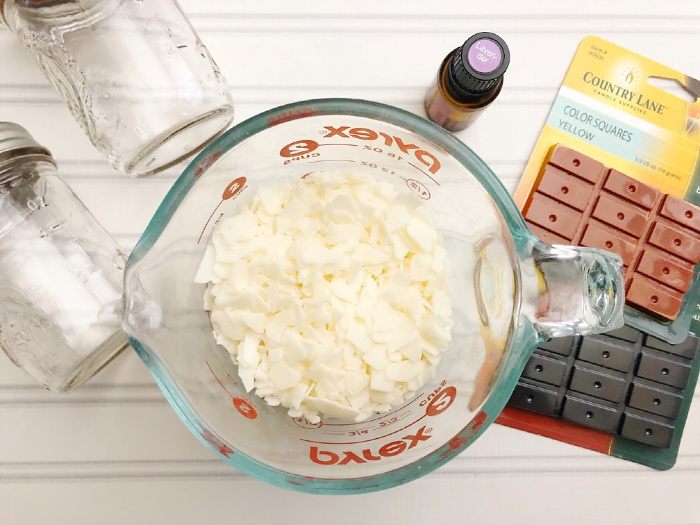 I’d love to hear how your DIY scented candle in a Mason jar turned out: let me know in the comments below what essential oils and scents you used! If scented candles aren’t your thing, you’re still in luck! There are plenty of other ways you can use your Mason jars–like as decor or gifts. 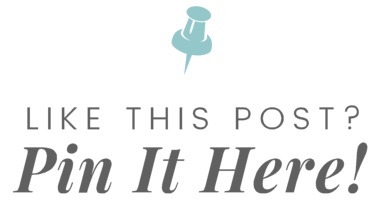 Follow the Mason Jar Decor and Mason Jar Gifts Pinterest boards for tons of ideas and inspiration!